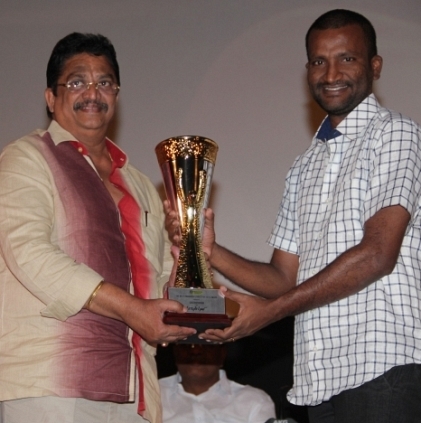 T Siva on behalf of Vendhar Movies conferred Suseenthiran with the award ‘Producer’s director'. Director Suseenthiran is one creator who has shown great consistency in the quality of work he delivers. Any actor can blindly get on board if the captain of the ship happens to be Suseenthiran. In the recently held audio launch of his next directorial Paayum Puli, T Siva on behalf of Vendhar Movies felicitated Suseenthiran with the award ‘Thayaripalargalin Iyakunar’ (Producers' Director). It is heartening to see a director being labeled as Producers' Director in a phase where filmmakers are looking at expanding their budgets to boost their ventures, while Suseenthiran handles moderately budgeted films and attracts better business prospects for his producers. Let the journey of success and laurels continue for this talented filmmaker! Simbu's Vaalu goes the old school way! Puli's producers are super-confident with the film ! Will Ajith's Next Be Directed By Suseenthiran? Paayum Puli's TN Release Rights Acquired By Escape Artists Motion Pictures Madan For A Good Amount. People looking for online information on Paayum Puli, Suseenthiran, T siva, Vendhar Movies will find this news story useful.